Indiana Jones and the Last Crusade is arguably the ultimate Indiana Jones movie. There is an ancient, religious relic to chase, an adventure that takes the hero cross-country, Nazis to fight and a temples to raid complete with booby-traps and puzzles to solve. Add family-ties and you get an adventure than at least matches Raiders of the Lost Ark if not surpasses it. From the beginning you are hooked into the world if Indiana Jones. River Phoenix plays a Young Indy and in one ten minutes scene you get an in-depth look at how Indiana Jones became the man he did. From his fear of snakes through to the scar under his lip and his penchant for whips, it is all included here and Phoenix delivers yet another performance which makes his early death so much more tragic. From this opening to the main quest of the movie, the film doesn’t let-up. The moments of exposition are done in a convincing and interesting way without dragging the plot or holding up the action. This is mainly because the story is much more personal for Indy, being a search for his Father rather than principally about the movie’s MacGuffin: The Holy Grail. This is where the genius of the casting comes into play. Harrison Ford is effortless as Indiana Jones and is just as charming, put-upon and out of his depth as he is heroically saving the world and defeating the bad guy. The casting of Sean Connery as his Dad is a move of pure genius. Connery fits the role so well. He is also charming but in a slightly different way. He isn’t an action hero but holds his own. He can believably chastise his son, be subtly impressed and deliver in the emotional scenes, which hold more pathos than you’d imagine. The fact that you could genuinely see Connery and Ford as father and son is testament to how well they work together and the chemistry they hold on-screen. Any Indiana Jones movie would be a failure without action that matches the quest. The Last Crusade doesn’t disappoint. From the amazing train sequence used in the opening we go to exploding ships, rat infested tombs, a boat chase, a bike chase, a plane battle and a stand-out sequence involving Indiana Jones versus a tank. 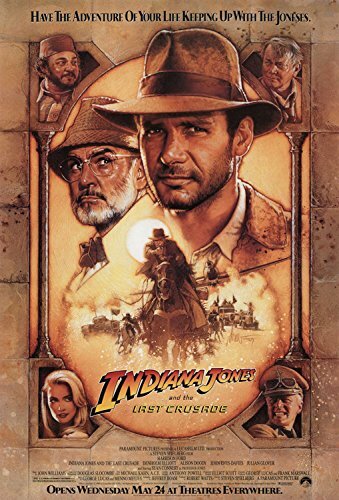 Last Crusade delivers the best action of the Indiana Jones series so far, showing the ability of director Steven Spielberg, as well as how ably Ford can be an action hero. Fittingly, the finale brings the film together in a compelling, edge-of-your-seat sequence. It involves puzzles and booby-traps which made the series famous. It all makes sense and never really feels silly. It also comes together in a sequence which tries to rival the now iconic ending of Raiders. What Last Crusade does lack is a decent villain. Raiders had both Paul Freeman as Belloq and Ronald Lacy as Toht. Here we get Michael Byrne as Nazi Vogel and Julian Glover as Walter Donovan. Both do a decent job but never really feel that threatening and are more of token bad guys to give Jones someone to fight. Alison Doody does better as the female lead and is at least Jones equal academically. Her story-arc is a more interesting one which makes up for some of the more one-dimensional characters. 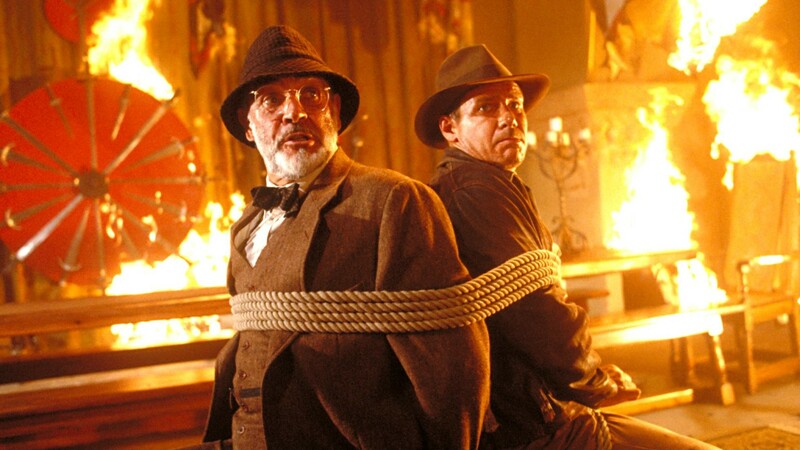 Overall, Indiana Jones and The Last Crusade brings the series back to it’s best. Ford is never better as Indy but Connery as his dad is perfect casting. The action is breathtaking, clever and some of the best of the Indiana Jones series. The finale matches all of this too and makes up for the more one-dimensional villainous characters. The best of the series? Crusade is perhaps my favorite Indy film … Ford & Connery, nuff said!